A parliamentary report of 1777 recorded parish workhouses in operation at Barnes (for up to 20 inmates), Mortlake (40), Petersham (6), and Richmond (90). Barnes had set up its first workhouse in 1758 in some parish-owned tenements which were already being used as pauper accommodation. The conversion was funded through the will of Mr Peter Marquet who in 1730 had left £50 for the poor of Barnes. All those in receipt of parish pensions were sent into the new workhouse where they clothed, fed, and put to work. Operation of the workhouse was supervised by a committee of ten or twelve ratepayers, and a master and matron were employed to run the establishment. The workhouse inmates were employed from 6am to 7pm in summer, and from 8am to 6pm in winter. Their breakfast was milk porage, water gruel, broth or bread and beer; midday dinner was pudding, beef or broth, rice milk, or bread and cheese; supper was bread and cheese, hasty pudding, or milk porage. Swearing or other disorderly behaviour was punished by a day's loss of meals, while refusing to work, or damaging or stealing workhouse property could end up in the Bridewell prison. 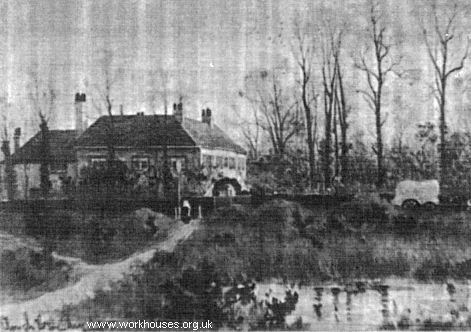 In 1777, problems with existing workhouse, especially its limited capacity, led to the erection of a new workhouse on a 23-acre site at the southern edge of Barnes Common. The new building, designed by Kenton Couse (architect of Richmond Bridge) cost £777 which was raised by the sale of annuities. Construction was completed by the autumn of 1778 and William Mears and his wife from the Wandsworth workhouse were appointed as master and matron, at a salary of £20 plus £1.1s. to Mrs Mears for tea and sugar. Twelve new beds, 4'6" wide with flock mattresses, were bought to supplement the two best bedsteads transferred from the old premises. A further three old bedsteads were kept for the new workhouse's "foul wards" which housed those with venereal and other conditions. Inmates from the old building were transferred to the new workhouse on 14th December 1778. Work carried out by the inmates included the spinning and carding of wool and, from 1812, the dressing of hemp and flax. Inmates also did much of the domestic work of the house, such as washing, cooking, and emptying the privy. Among the tasks given to children was the scaring away of birds from a field where peas were being grown. The workhouse ceased operation in August 1836 when the inmates were transferred to the new Richmond union workhouse on Grove Road in Richmond. The property was then let and became known as the Manor House until its demolition in 1961. Barnes former parish workhouse c.1885. Former Barnes workhouse site, 1871. A new purpose-built workhouse was erected on Grove Road in Richmond in 1786-7. It was a two-storey building with an H-shaped plan with its entrance at the side to the south. Richmond main block from the north-west, 2001. According to a plaque on the building it was "Erected by the Munificence of His Majesty George the III for the used of the poor of Richmond and Kew". Richmond main block detail from the north-west, 2001. The Vestry took possession of the building in April 1787, and it was in use by October that year when minute books record the sending of paupers to the "new" workhouse — indicating the existence of an earlier establishment in the parish. In May 1787, the Vestry had also decided to add a new infirmary, and a place for lunatics and disorderly persons. Surrey: Barnes (2), Kew (2), Mortlake (3), Petersham, Richmond (5). Later additions: North Sheen (from 1894). The population falling within the Union in 1831 had been 12,805 — ranging from Petersham (610) to Richmond itself (7,243). The average expenditure on poor relief for 1833-5 had been £4,671 or 7s.4d. per head of the population. In 1836, alterations costing £497.17s. were made to the workhouse building to bring it in line with the requirements of the 1834 Poor Law Amendment Act. A plan of the main building from 1886 shows the layout of the main building. Richmond workhouse plan of main building, 1886. Outbuildings at this time included contagious wards, an Irish ward, a laundry folding room, an ironing room and drying room, a wash house and laundry, a nursery dormitory and day room, a chapel and vestry, a sawing and wood shed, a stone yard, male vagrant wards and a coach house and stables. In 1901-2, new infirmary buildings were erected at the south-west of the workhouse. Designed by EJ Partridge, the facilities comprised a female infirmary block, lying-in ward, nurses' home, male infirmary block, lunatic wards, and a combined ambulance house and mortuary. The main infirmary blocks were three storeys high, each floor having a twentyt-four bed "Nightingale" ward plus a separate three-bed ward. A three-level corridor linked the two blocks with short branches also going to the two -storey nurses' home and single-storey lying-in ward. Richmond 1902 infirmary from the north showing (left to right) female block, lying-in ward, nurses' home, male infirmary, lunatic wards, ambulance house / mortuary. Richmond union infirmary and dining-hall blocks, c.1905. Richmond union infirmary ward interior, c.1905. During the First World War, the workhouse was taken over for use as a military hospital. Richmond Military Hospital from the east, c.1916. The workhouse later became Grove Road Hospital but has now been converted to residential use. Apart from the main building, little survives other than the former entrance lodge. Richmond entrance lodge from the west, 2001. In the 1890s, the Richmond Union operated what was described as a cottage home at 11-13 Cleveland Road, Barnes. The home was closed in around 1901. The union then established several scattered homes which in 1908 were located at 16-18, St Leonard's Road, Mortlake, with a boys' home at 1 St Leonard's Road. A Receiving Home for new admissions to the homes was originally at 17-19 Peldon Avenue, Richmond. A Receiving Home later operated at 25-27 Hardwick Road, Meadvale, Redhill, and in the 1920s at Parkshot, Richmond. Surrey History Centre, 130 Goldsworth Road, Woking, Surrey GU21 6ND. Holdings include: Guardians' minutes (1836-1930). Richmond Local Studies Library, Old Town Hall, Whittaker Avenue, Richmond TW9 1TP. Holdings include Admissions and discharges (1843-1855, 1861-1974 with gaps); Births (1866-82); Deaths (1914-74); Creed registers (1844-1937); etc. The Centre's website now has a searchable catalogue of over 100,000 people who applied for poor relief in Richmond between 1870 and 1912. Fowler, Simon (1991) Philanthropy and the Poor Law in Richmond 1836-1871 (Richmond Local History Society).